^ not the nicest responce to an honest question..
8701, the amount plastic surgery would effect the skin to is so minimal that no human eye would notice. 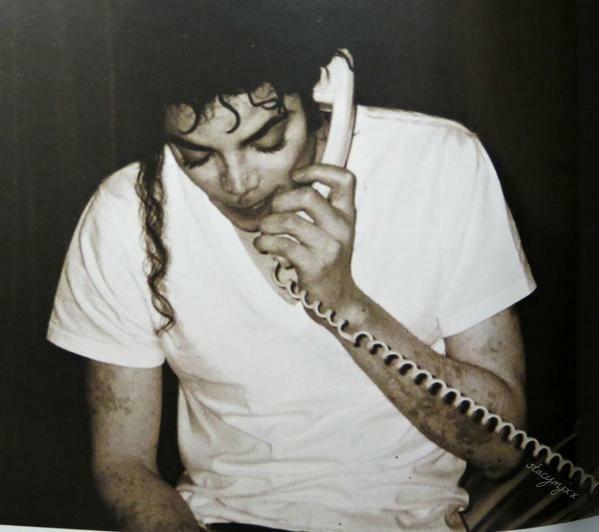 What we see with his skin Tone is all vitiligo, makeup, and vitiligo treatment cream that was used.. The things that changed the most in Mike's appearance outside of aging are his inner eye beds, nose, lips and cleft, and a but his eyebrows.. It's not like people say where he looks like a different person but changes were obviously made, some unintentional like his eyes.. I cant confirm this is why but many people that get multiple nose jobs the inner eye beds get effected. The more you pinch your skin inwards towards your nose the wider your eyes get from that inner bed area.. that is what I always though was the cause of his eyes looking slightly more bigger and less of that MJ curve in the lower eye area. Like the dangerous cover..
Michael didin't shoot for the Dangerous cover, the eyes are based on previous photos of MJ like the Bad cover, Mark Ryden said that. I’ve always been curious to know what the last pictures are of Mj during the Bad Era with his mix raced skin tone to the first appearances of the pale white for The Dangerous era. Does anyone have any pictures of this period of change? Errrrrr okaaaaaay! Another CRAZY thread on here..... what's the next gonna be? I think it’s fair to talk about, its barely talked about on here anymore after his death which is a good thing. But at least there isn’t people saying he bleached his skin because he wanted to be white or that he had EVERYTHING done, I feel comfortable seeing his fans talking about this knowing that they aren’t going to go over the top saying he had literally everything done. One thing that is rarely mentioned is the make up on his nose. 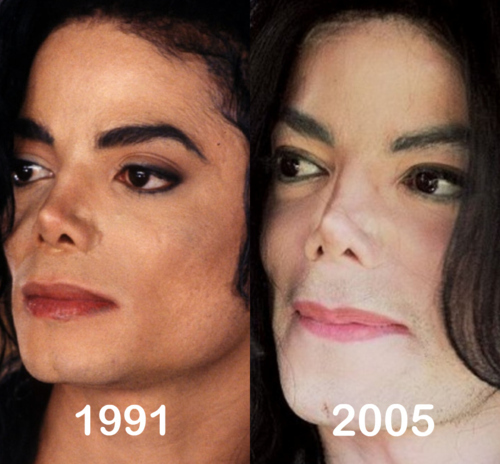 It’s called nose contour and a lot of impersonators actually do it to make their noses look like Michael’s, but he actually did this himself for years which makes his nose look drastically different at times. I also think something happened to his lips from 1998 onwards and his smile was never the same after that, his top teeth never fully showed again but it could be due to Lupus. I dont think Michael's image should really be that threatening to fans.. we hear it towards our entire life yet we cant habe a loving open discussion amongst ourselves? 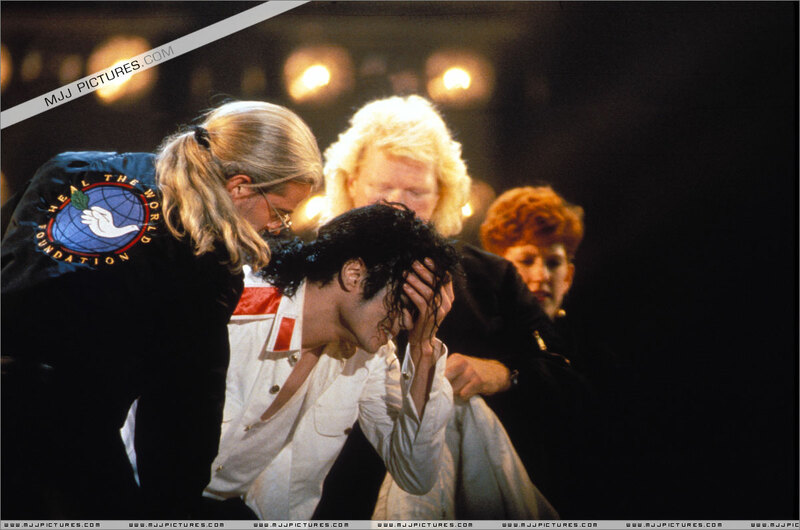 No matter how much work he got done or lack of , it played a huge role in Michael's life. It obviously afflicted him, we should be able to discuss the obvious. Especially when we all come from a place of love. It's the first time I hear this logic. It's like the stupid logic who said Michael bleached his skin. I mean, he did. Not for the reasons a lot of people say, but he did. Nope. I'd give you from Black or White until early 1997. But that's it. I think it was until 1999. After the HIStory Tour he had lost weight, but the nose still looked the same. It was before the Invincible promo began that he must have underwent another drastic (maybe necessary) nose surgery. It looked a lot shorter in profile from that point on. The light in photoshoots and post production of course also made his skin tone appear differently from time to time. But the change from makeup-white to complete pale was still visible. Just my 2 cents of course. (I'm a fan since 1988). Last edited by Electro; 17-12-2018 at 09:10 PM. By the way, has anyone ever seen the full version of it?